Are you having problems uploading your files? If you are having problems uploading or downloading, ensure that you have the latest version of flash player or try a different browser, such as Firefox or Google Chrome. Did you find your models posted by someone else? 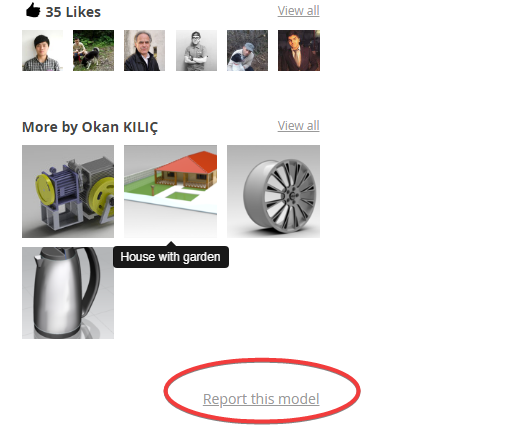 If you see your models posted by someone else on GrabCAD without attribution, please report it to us and refrain from posting comments on the model. You can 'Report' a model by using the the ‘Report this model’ button found on the bottom right side of the page under ‘Similar models’. If your model is inappropriately posted on an external site, please let us know at cad-responsibly@grabcad.com and contact the admin for that site, too. We recommend including a link to their post along with a link to your model on GrabCAD. Your GrabCAD model can act as a timestamp for when you created a model and acts as documentation and a reason for them to remove their inappropriate post. We respect and appreciate every model uploaded to GrabCAD and will remove any wrongly posted models and support you in your efforts to have work removed or properly represented on other sites, as well. How do you remove other member's files from your project? Hover over the file you wish to delete. Click the arrow icon to show the dropdown menu. Choose 'Delete file' from the dropdown menu to remove the file. What file types are supported by GrabCAD? For more information on the 3D viewer, including what file types are supported, take a look at our support article on the topic.